Amy and Chris are getting married this September at Tupper Manor, and I finally convinced them to have an engagement session before the big day! Amy is an art therapist who works with troubled teens, and Chris works for a think tank in Somerville. The two of them met through OK Cupid and have been together for two and a half years! At first, both Amy and Chris resisted the idea of an engagement session because they are both uncomfortable getting in front of a camera. What’s more, they both feel like engagement sessions can look corny, staged, and unnatural. Add to that the idea of taking pictures in public with random strangers passing by, and you can see why they were nervous! Eventually, they agreed to do a shortened session at their home in Medford, MA. Instead of doing a traditional portrait session, Chris threw out the idea of doing a “Day in the Life” session, which of course I loved! We did a few quick portraits and then moved on to documenting some scenes that would happen during a typical day. We started with Chris shaving and Amy brushing her teeth in the bathroom mirror, then moved on to their morning rituals in the kitchen. They even make preparing food look cute! 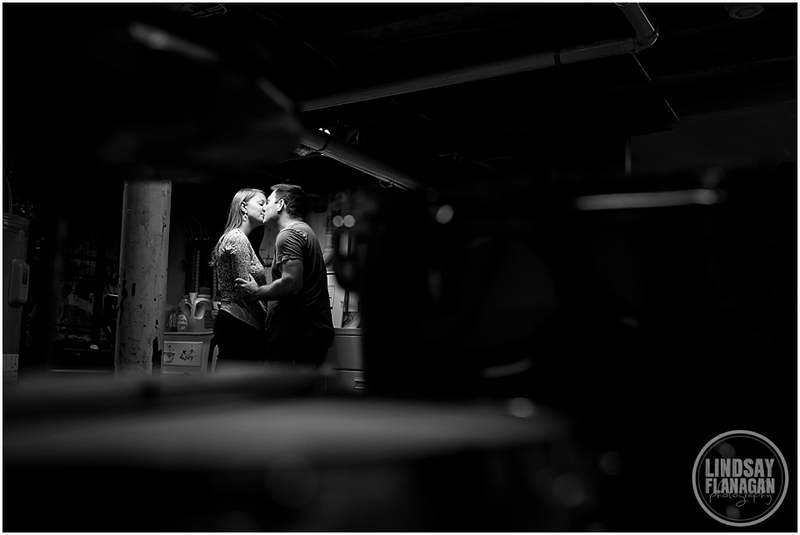 I love the image in the basement with Chris playing drums and Amy doing laundry in the distance. And I loved when Chris walked over and gave Amy a little impromptu kiss by the washer and dryer! Then, they watched a little TV, cuddled on the couch, and had chili for dinner afterward. They spend an hour or so before going to sleep each night reading and surfing the web, so the session ended with the two of them climbing into bed. Chris & Amy, thank you for letting me talk you into some engagement pictures! It was so much fun to get to know you a little better before the big wedding day. I can’t wait for September!